Terry Butcher is hellbent on improving Hibs’ dismal derby record, with the new manager keen to see the Easter Road side establish themselves as the top dogs in Edinburgh. Hibs fans have grown particularly frustrated by seeing their team win only two of their last 18 clashes with Hearts, while it was results against the Tynecastle side – the 5-1 Scottish Cup final defeat and two 1-0 defeats this season – that did most damage to previous manager Pat Fenlon’s stock. Butcher is all too aware of the importance of local bragging rights, having played for Ipswich in the East Anglia derbies and for Rangers in Old Firm derbies. He enjoyed a proud record as Inverness manager in the Highland showdown against Ross County and is relishing the prospect of being involved in the fiercest derby in the Scottish Premiership. Although touched by receiving a congratulatory text message from Gary Locke yesterday upon being confirmed as Hibs manager, Butcher, who has signed a three-year deal, is already looking forward to locking horns with the Hearts manager in the New Year derby at Easter Road seven weeks from tomorrow. “I’ll definitely be looking to address the derby record,” he told the Evening News. “I love derbies. I normally end up having a bust-up with the opposing manager, but I must say Gary Locke sent me a lovely text and that was nice of him. He’s a lovely guy but I’ll look forward to beating his team. Butcher knows the Hibs fans hanker for a team to feel proud of and he believes that, in the long term, he can deliver what they want. 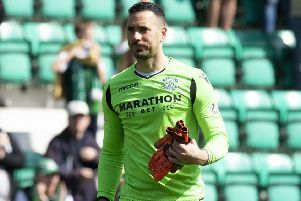 He intends to turn Hibs into the fittest, hardest-working team in the Scottish Premiership, and believes that once he and his assistant, Maurice Malpas, get those fundamentals in place, the free-flowing football the supporters crave will soon follow. “You only have to look at Caley Thistle to see that we like to play good football,” said Butcher. “We brought players from obscurity and got them playing good football. We coach good football but we want to be hard to beat first and foremost. We’ve got to change our mindset and make sure we’re far more resilient, far tougher, far stronger and far fitter. The fitness comes from the intensity of the training. I’m not saying the boys are unfit but we want them to be fitter. Maurice is the best coach in Scotland and under his work, they’ll know they have to train at an intense standard if they want into the team. Butcher was at Firhill last night to see Hibs Under-20s lose 2-0 to Partick. Meanwhile, three Hibs players have earned late international call-ups, with James McPake and Ryan McGiven drafted into the Northern Ireland squad to face Turkey away on Friday and Owain Tudur Jones called into the Wales squad for Saturday’s clash at home to Finland.